An excerpt from Gaillard’s Les cent-jours de Rosalvo Bobo (1987), which is volume one in his series on the United States occupation of Haiti, titled, Les blancs débarquent. 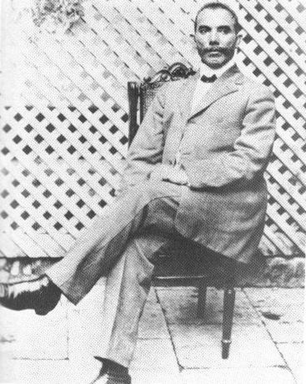 Gaillard wrote numerous volumes on Haiti and was president of la Société Haïtienne d’Histoire. [Below] is an open letter from Rosalvo Bobo to the president of the United States. Less than a month after the presidential election, [Bobo] protested the [political] maneuvers that blocked his path to the presidency which he so coveted. In his political statement dated 8 September 1915 and written in Santiago de Cuba where he was in exile, Bobo described his meeting [with the United States Admiral Caperton] on board the [U.S.S.] Washington: "I was about to make my way to Port-au-Prince with my army when Admiral Caperton, your ambassador, sent to me a commission that included, among others, the city’s archbishop and a former Haitian president. This commission presented me with words of peace and an invitation to come to Port-au-Prince as soon as possible and meet with [Caperton] on board of an American cruiser… I [Bobo] repeated to [Caperton] what I had said on numerous occasions in my writings and at meetings: [I have] great admiration for the North-Americans whose energy, industrious activity, work methods, and economic discipline provide us with an example. I have always hoped to invite them to share their capital and knowledge to help improve our country. But in accordance with the Haitian people I was quick to add that we would never allow [American] presence in our country on any terms other than as beneficiaries of our benevolence and hospitality. We would never permit any form of interference in our domestic policy by the United States government or any other foreign power." The purpose of the conversation was not to offer the presidency to Bobo. When this question was raised, Bobo reiterated his earlier declarations, which he would never compromise. Following Bobo’s death in 1930, a close confident asked Charles Zamor his opinions on [what Bobo meant when he said] "never." According to [Zamor, who had been] Bobo’s companion, this was not a "historical word." He added that "When [Bobo] learned the American would demand to control not only the customs [house] but also a [governing] convention, Bobo, for sure, let him know bombastically that he would never accept the presidency at such a price. 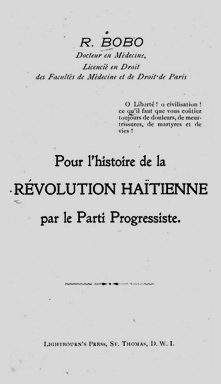 He had already stated this for all to read in his [book,] Appel au Peuple Haïtien, written in April 1915. But the word ["never"] was not employed to turn down a spontaneous offer for the presidency. He was never offered anything, for the dye had been cast even before he arrived.